Luxaflex® recommends using a window covering professional to expertly measure and install your window shades, blinds, shutters and awnings for proper fit and function. At most Authorized Luxaflex® Showrooms you will find this professional service when purchasing a new product. Anything less than a perfect fit means less than a perfect look. So when you’re ready to find the right window covering, you’ll want to make the most of your investment by hiring a professional installer. Visit your local Luxaflex® Showroom to get in touch with a professional installer you can trust. Measure each window thoroughly. This includes horizontal measurements at the top, centre and bottom, and vertical measurements along both sides and at the centre. Then take the additional and important step of measuring diagonally too. These measurements combined will reveal whether or not your window is square. If a window isn’t square, consider an outside mount, installing the window covering above your opening. If your window treatment telescopes to one side as it is raised, the window may not be level. Many shades have an adjustable bottom rail weight. It can be moved to compensate for the window frame and prevent telescoping. Are your window frames square? Should you consider an inside – or an outside-mounted installation? Which products have an inherent gap between the shade and the window frame? All of our window coverings are designed and custom made by Luxaflex®. Our longstanding commitment to quality and innovation means you’ll enjoy choices at Luxaflex® that you won’t find anywhere else. What is your decorating style? Contemporary, traditional, rustic? Is privacy and light control a main concern? Which material will work best in your room? The type and colour of fabric will affect the amount of light coming into your room. Do you want a shade that rises fully for the view, or a sheer that gives view through with UV protection? How do you want to operate your shade? There are many options from cordless to motorization. At your local authorized Luxaflex® Showroom you get the help and advice you need to help you decide exactly what will work best for you. Where can I find Installation Instructions and Guides? Installation guidelines for each product can be found here. It is important to know the required space and correct type and quantity of installation hardware to safely and securely install a window covering. 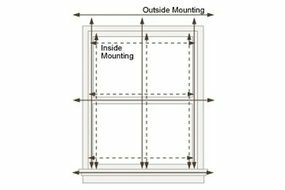 What mounting depth is needed to properly mount your installation hardware? Is the mounting surface level? If you need assistance with installing your product, please contact your dealer.